Do you want to know more about the bicycle? Here you will find some interesting facts and information about bicycles. historians think that they did not. 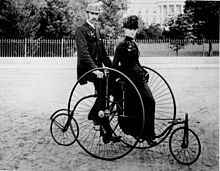 They found out that there were bicycles invented before them. Sauerbronn, who was a German. This bike was called the laufmaschine. It did not even have pedals. You had to push it with your feet and it would roll.